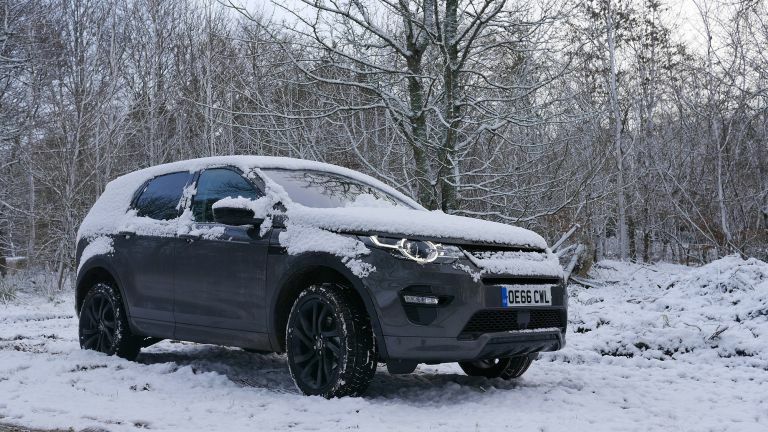 T3 Drives: Is the Land Rover Discovery Sport the perfect car for winter? With everyone travelling home over the festive period, Christmas is one of the busiest times for the UK road network. It’s also a particularly taxing time on the vehicles - needing to cope with presents, people, and tricky road conditions. With that in mind, we set out to find the perfect car for a Christmas in Scotland - big enough to fit six adults, family pets, plenty of presents, and with the ability to tackle tough terrain. Oh, and some tech to keep me entertained is a bonus as well. Okay, so there are probably a few cars up to the job, but our love of British brands led us straight to Land Rover and the updated Discovery Sport. The Discovery Sport prides itself on four key areas; versatility, capability, technology and design. The car features a 5+2 seating layout, with numerous configurations depending on your need. The third row of seats are more suited to children or short trips as the legroom is limited. Despite being the baby of Land Rover's line up, the Discovery Sport is no slouch off road. You get Terrain Response to optimise the vehicle’s engine, transmission, differential, and chassis to suit the terrain you’re driving on. There’s also all-terrain progress control, (ATPC) which ensures steady progress on low-grip surfaces. We made use of both the Grass/Gravel/Snow setting, and ATPC on the tight highland back roads and didn’t end up in a ditch (so it must work). The Discovery Sport is packed with technology, to make driving less stressful, and being a passenger more entertaining. Head down to the technology section for more information. Finally, just look at it. We think the Discovery Sport looks great (especially in this spec), equally at home on the streets of London as it is in the Highlands. It’s sleek, futuristic, and pretty menacing as well. It’s no slouch inside either. The Disco Sport is pleasingly luxurious, sure, it’s no Bentley or Range Rover, but there’s plenty of soft plastic, leather and metal in the cabin. Despite it’s name, the Discovery Sport isn’t all that sporty, with a 0-62 mph time of 8.9 seconds it’s not fast by any means. It’s punchy enough out of junctions, and has plenty of grunt on the motorway however. We found the car very comfortable over the long journey up to Scotland. It’s also impressively quiet, with good isolation from both road and wind noise. The nine-speed gearbox is smooth, and we didn’t have any problems on small icy roads either. The Discovery Sport is one of the cheapest entries into the luxury marque’s stable, but does that mean it skimps on tech? Of course not! Admittedly, we did have literally every box on the option list ticked, but the Disco Sport comes with all the features you’d expect from a modern luxury vehicle. Key features include Adaptive Cruise Control which maintains a distance between you and the car in front (a must if you spend a lot of time on motorways), Heads Up Display, Lane Departure Warning, Driver Monitor Assist, Heated and Cooled seats, and automatic lights and windscreen wipers. With the InControl Remote smartphone app you can check your fuel level, start your vehicle to pre-condition the interior, find your vehicle in a packed car park, and check that you haven’t left a window open, all remotely. Perhaps the biggest and best update is that the Discover Sport now packs JLR’s InControl Touch Pro infotainment system. Gone is the small display and dated UI - now replaced by the 10.2-inch screen and intuitive OS. This is definitely an option you should choose when speccing the car. It’s great to see Land Rover is focusing on this area, it’s gone from having one of the worst systems to one of the best in the space of a year. We were really impressed with how much the Land Rover Discovery Sport coped with over the holidays. It’s comfortable, capable, and looks great as well. We also really like the spirt and ethos behind the vehicle, and thanks to the updated infotainment system it’s now even easier to love.